Soft serve ice cream machine are great for both a business and customers, but let’s face it, they can be a pain to clean. In general, ice cream machines are designed to be cleaned by low-skilled employees, but that doesn’t mean you should take cleaning for granted. So why is it so important to clean an ice cream machine? Because it helps you provide a high-quality, safe product to your customers, and can help you avoid the high cost of repairs and replacement. Food safety is paramount in the restaurant industry, and thoroughly cleaning everything from countertops to advanced food-prep machines is vital if you want to have a long-lasting business. Soft serve ice cream machines are no different; in fact, properly cleaning them may be even more important, as dairy products can cause certain bacterias; bacterias that can multiply dangerously if left unchecked. Many restaurants and food service businesses have hundreds or even thousands of dollars invested in their ice cream equipment. It doesn’t make sense to let that investment go to waste. With proper cleaning, an ice machine in more likely to last for many years, giving customers a delicious treat and giving your business a steady stream of income. For example, with thorough cleaning, hoses and o-rings are more likely to last through months of use. 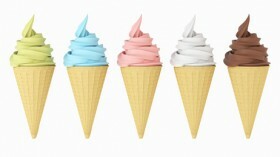 Without the right cleaning procedures, the quality of your soft serve ice cream machine and frozen yogurt can suffer. Without proper cleaning, important components like the condenser or scraper blades may become ineffective, which can harm the quality and consistency of the ice cream and frozen yogurt you are serving to customers. While routine, daily cleaning of ice cream machines is important, having a trained, knowledgeable professional take care of the more advanced cleaning and maintenance is essential. By having a professional take care of the job, you ensure that everything is done properly. Advanced parts like the condenser may become clogged with dust, lint, and debris, or parts that need to be replaced, including o-rings and seals, may go unnoticed. Having a professional cleaning gives you peace-of-mind knowing everything has been handled properly. As you can see, proper cleaning of your ice cream machines is extremely important. Not only does it help maintain your expensive equipment, it helps you serve a high-quality product that is safe to eat. Whether you have a Taylor, Electrofreeze, Stoelting, Saniserv, Cold Elite, Carpigiani, or any other brand, make sure you are always cleaning them right!